This is a true story. We went on a 17 days trip round the beautiful island of Taiwan in Dec 2014. 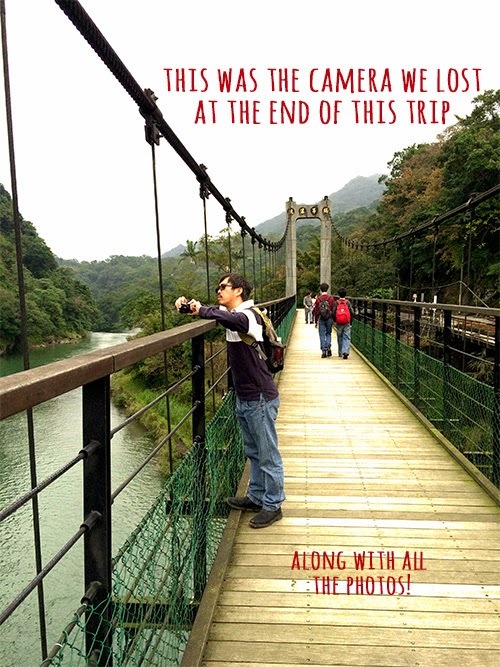 About 3,000 photos of awesome gorges, coastal vistas, lakes, mountains, even day to dusk to night views of Taiwan 101 later, my husband lost his camera on the night of Day 16. None of the photos were downloaded anywhere because he had just bought a super 64G memory card! He believes it was left in a taxi and he realized it minutes after alighting but it was too late. And it was his barely one year old Canon 120! At that moment he said he felt physical heart pain! It was horrible! Eventually we recovered after some drama moments and could even enjoy our last day of the trip feeling lighter and more in the moment than ever (smile). Here's my husband with the poor doomed camera doing what he does on the trip. Think what a giant blow it was to the scrapbooker in me! But guess what's part 2 of the story: iPhone and Project Life app saves the day! Because I used the PL app to document the trip as we travelled, I made sure to take at least a few shots of each place, activity, scene etc on my phone. And these are now the only photos we have from the trip! And I was shocked (and so glad) to find i had over 800 photos on my iPhone!! 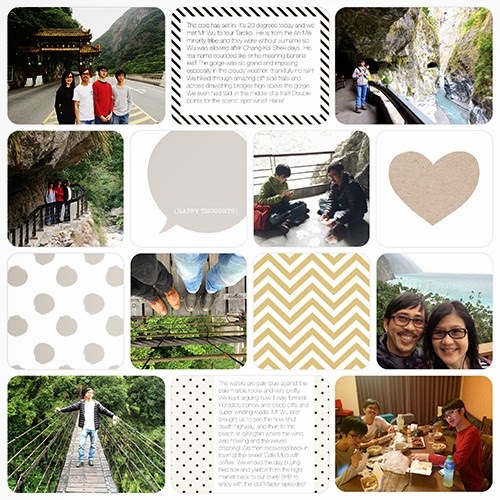 They were all snapshots, unlike the carefully composed artistic photos my husband is so good at taking, but they were there because I wanted to capture enough for my PL app layouts. Thankfully I'm compulsive this way, lol. 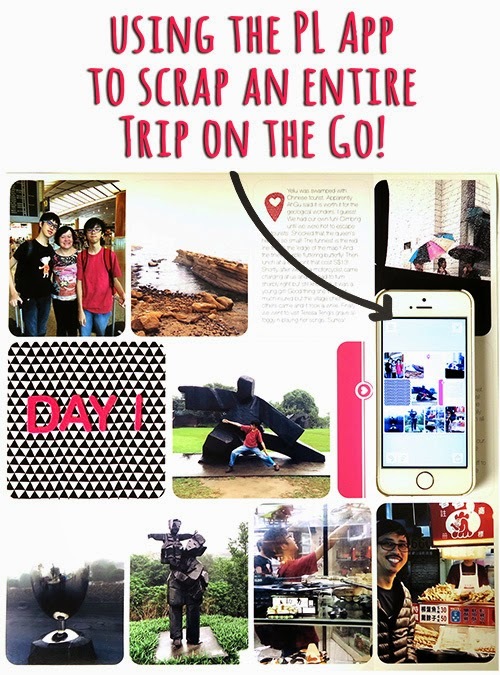 Each day on our trip I would start a new page in my PL app, and add photos or journalling on the go. 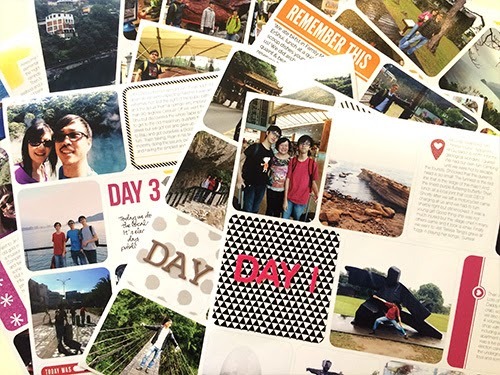 It was super easy and quick, using bits of time while travelling or waiting for our meal, by the end of each day, that day's PL including travel journalling was done! Imagine how precious these pages were that night when we lost dh's camera! Let me show you the pages which were already completed on the App when I got home. 1. Plan ahead. Think about how you will organise your pages (mine were mostly one day a page), or do you want to organise by theme, how much journaling you want, how many pages to fill up. Just a general plan so that when you hit the road, you can start your page without worry! There are many page protectors to choose from, I switch around a few favorites like this one. 2. I found that journaling on the app is simple, and you can adjust the font size, but there is a limit to how many words can be squeezed on a card, depending on the space on the chosen card. So have an idea how much journaling you will do, so you know how many cards for journaling you will need. In this page, the journaling cards I chose had less space for words so I ended up using 3 spots for journaling. 4. Photo collages are great for squeezing more photos on to a 4x6 pocket space, and you can do this right on the PL app. If the options you want isn't there in the pocket design template choices, you can still make the collage, save the image into your camera roll, and then use it as a photo insert in another PL pocket template on the app. Like this page which I modified from the 'squared away 2' design template. 5. 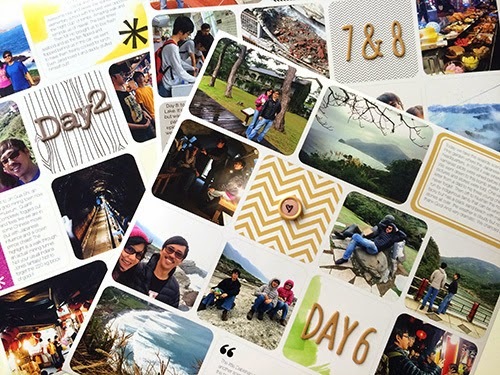 Enlarging a photo beyond the size of one pocket. 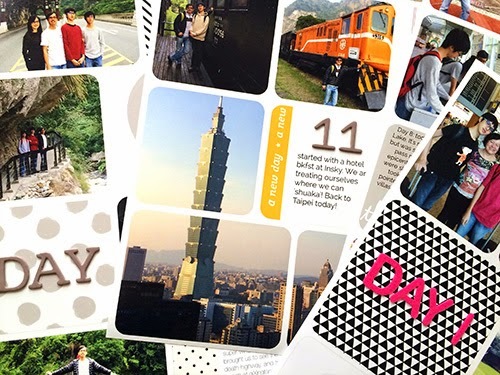 In this page below, I enlarged the photo of Taiwan 101 over 3 pocket spots. There was no trick to this, I simply used the same photo 3 times in the 3 spots. I enlarged them and moved them into place, visually adjusting until they look right. Careful minute movements of the fingers on the app! I sent my layouts to print at Persnickety, look how beautiful they turned out! When they arrived I added letter stickers to identify the days and to add dimension. All in under half an hour! 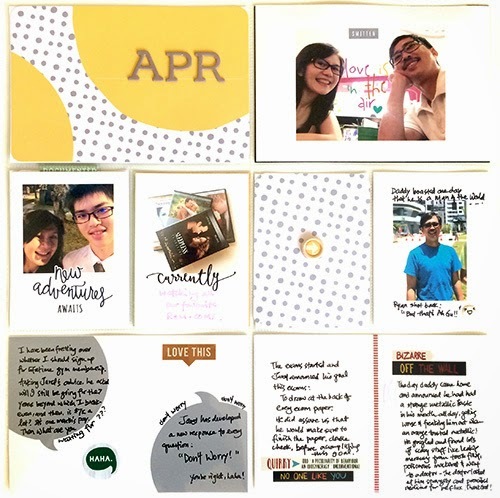 Here are my digital April pages this time completed with Yin templates 380A and 380D. 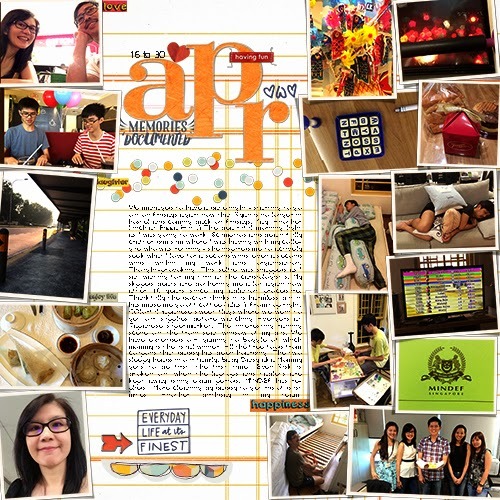 This is my fourth year completing my P365 layouts on a half-monthly basis and I'm still going strong and loving it! See the completed years here and here. Since I already captured a photo a day, I use PL to tell stories and sometimes there might be more, or less. It doesn't matter! 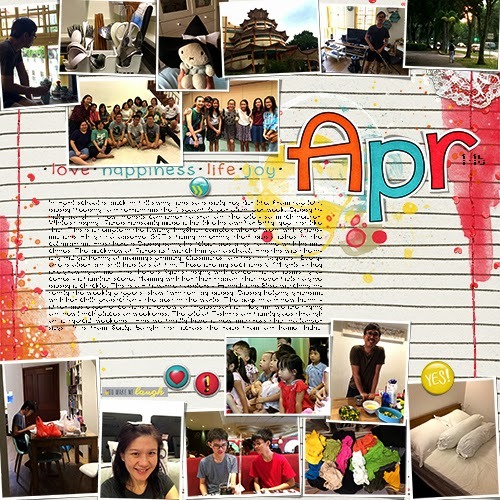 Only one spread this month, capturing anecdotes and inside jokes and the like. Love the fun in our mundane. I used cards from Becky Higgins card set - All About Me, and wood button from Shimelle. The rest were completed using digital supplies and printed out. I love how simple hybrid PL can be! If you enjoyed your visit, sign up for my Yin Designs Newsletter Here - where you'll be updated on freebies, sales, new templates and so on about once a month. Thanks for your interest! Yes I too mainly used the App for trips, because I still print out my monthly PL pages hybrid style to slot into the pockets. But for the trip it was so great to be journaling and completing the pages on the go, when it was all fresh. The best part is completing the last of them on the plane home! I can't begin to imagine how gutted you must feel! So sorry to hear. I'm not crafty at all, and I'm so glad my friend suggested the PL app because it's cheaper and more environmentally-friendly (I think I would probably waste a lot!! lol), and so easy to do on the phone! 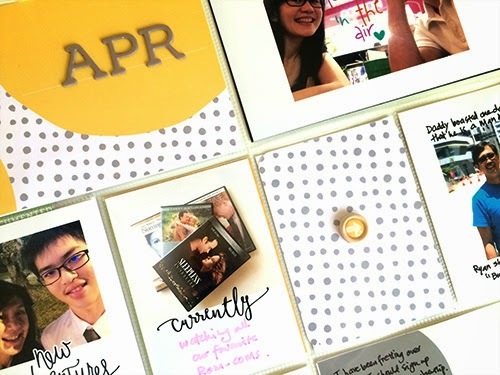 Your scrapbooking is really an inspiration! Hallo, ich fing an deinen post zu lesen und dachte "was für ein Drama" :-( aber dank dieser App hast du alles super gerettet !!! Ich liebe Güte App und benutze sie seit diesem Jahr für mein PL. es ist so einfach und schnell gemacht. Yes, thanks to PL App indeed! Thanks Emma! So sorry about the camera...your husband takes such beautiful photos. I lost a camera once and back then there were no smart phones for backup pictures. I really like the idea of scrapping on the go though. Great layouts, as usual! I will have to give the PL app a try.